Fr. George Mader, with his parents and siblings, on the occasion of his first Mass on May 24, 1959. 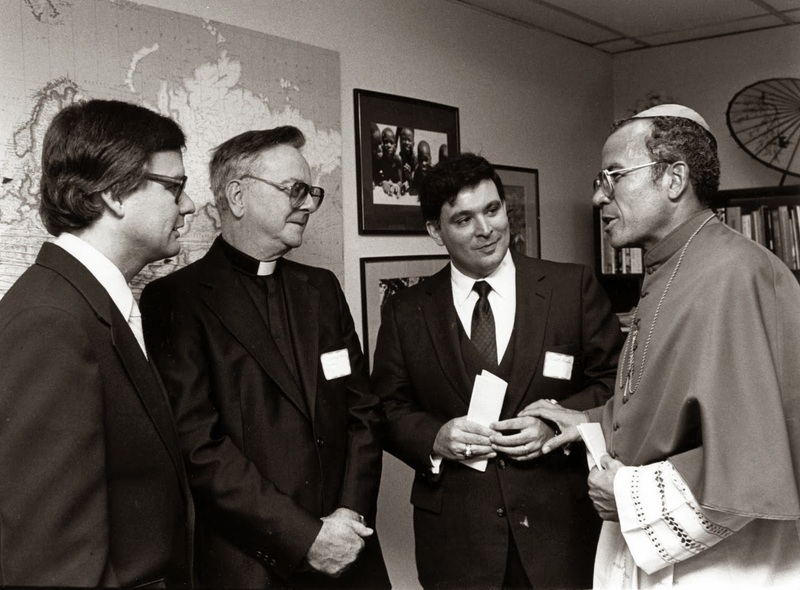 As Catholic Volunteer Network commemorates our 50th anniversary, the celebration would be incomplete if we did not take some time to recognize our founder, Fr. George Mader. George Leonard Mader was born on November 28, 1927 in Irvington, New Jersey. He was the oldest of five children. After finishing his schooling, he spent a few years in the work force and eventually started his own company, GLM Corps Recording Systems, which made and sold recordings of drum and bugle corps. The unexpected death of a close friend caused George to seek more meaning in his life. In 1950, he decided to change paths and entered the School of Divinity at Seton Hall University, South Orange. He completed his seminary training at Immaculate Conception Seminary, Darlington. Fr. 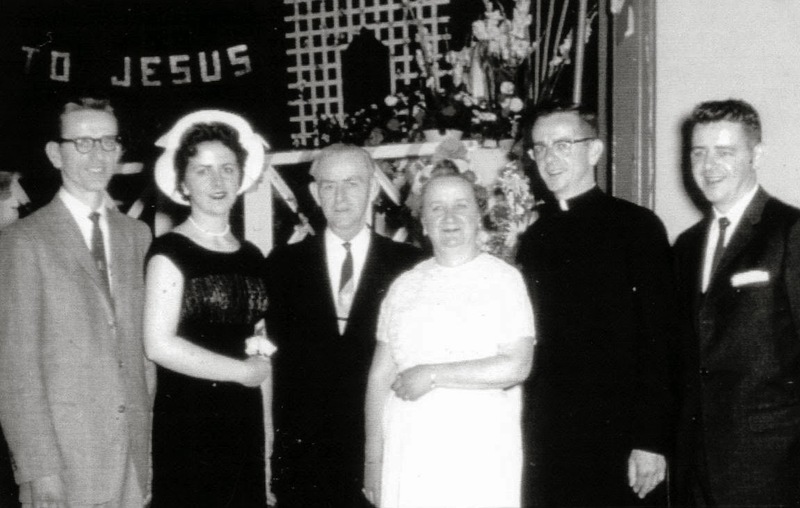 George Mader was ordained a priest for the Archdiocese of Newark on May 23, 1959. As a young priest, Fr. George was moved by the decision of his younger sister, Pat, to engage in full-time volunteer work. The year was 1961 and, after feeling the desire to “do more,” Pat began looking for an opportunity to serve. Despite initially feeling drawn to serve in Africa, she ended up in Farmville, North Carolina, serving with the Mission Helpers of the Sacred Heart, as part of the “Mary Missioners” program. Soon after her return to New Jersey, Fr. Mader had the idea to form a central office that would serve as a catalyst for lay mission work. He knew that there had to be a better way to share the many opportunities for lay people to serve the Church. Together, he and Pat drafted a proposal for this office, which was eventually accepted by then Archbishop Thomas A. Boland. Thus, the Newark Liaison Foreign and Domestic Lay Missionary Apostolate (later to be renamed Catholic Volunteer Network) was born. Fr. Mader served as the Executive Director of this organization from its start in 1963 until 1976. In the early days, the Lay Missionary Apostolate placed volunteers from Newark in service positions across the U.S. and abroad. Fr. Mader and Pat worked tirelessly to increase the awareness of these service opportunities, and placed over 400 volunteers in their first eight years. Around 1972, the decision was made to become a coalition of mission agencies, rather than focus on volunteer placement. Even though it has been nearly forty years since his days as a full-time staff member, Fr. Mader has remained an important figure in the life of Catholic Volunteer Network. We continue to be inspired by his vision and passion for lay volunteer service. We honor his legacy with the annual distribution of an award in his name. Other priestly assignments of Fr. Mader have included: St. Aloysius, Jersey City, parochial vicar; Archdiocese of Newark, clergy personnel; St. Catherine of Siena, Cedar Grove, parochial vicar; and Ramapo College, Mahwah, chaplain. Fr. Mader is currently retired, and lives in West Orange, New Jersey.